Easiest Way of SMS Marketing for your business! In today's competitive world, It's becoming extremely important to grab your audience’s attention and make your Business/Brand/Services known to them. Having the four P's of marketing (Product, Place, Price, and Promotion) in mind, you should not only offer a product or service of outstanding quality but also find the right channels to market your brand and create a connection with your audience. It’s hard to believe, but in the world full of incredibly advanced IT, the good old SMS marketing remains a powerful means for businesses looking to build an engaged customer community. 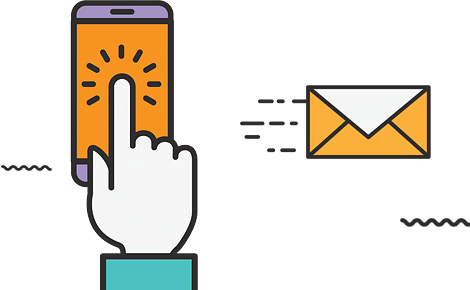 In order to help you reach out to your targetted audience, we at Accucia, have come up with a simple and outstanding bulk SMS Application, SMSPAD! Recent studies conducted in the United States of America reported that there are over 2.4 billion brand-related conversations happening on an average on a day to day basis, which goes to show the potential this marketing technique holds to create awareness about a certain brand or a product. Another study indicated that more than 60% of all new business came as a result of referrals. After having employed this strategy at Accucia softwares, we have seen great results thus far. As much as 78% of our business has been coming through referrals! Have you ever imagined a hassle-free Bulk SMS promotion, which is very smart to your business and appealing to your customers? *Operable across PAN India only.